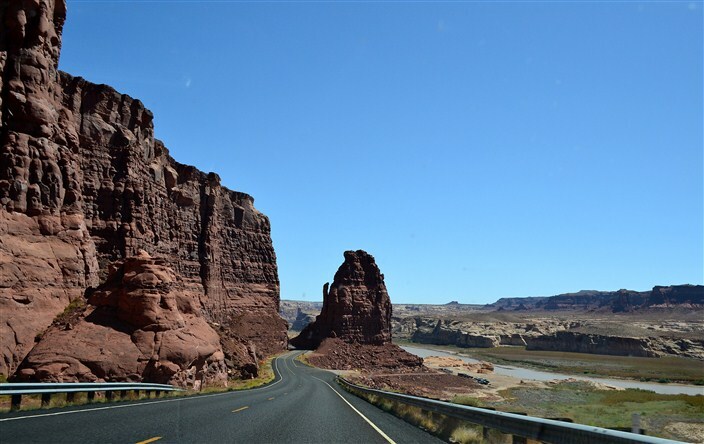 It’s that time of year again here at Prohltravel: time to load up the car, fill up the gas tank, grab the road maps and hit the highway for USA Road Trip, 2016 Edition! This time we’re heading south, destination New Mexico, Arizona and, of course, a whole lot of points inbetween. So buckle up and come along for the ride…well, metaphorically speaking, anyway. The Civic’s kinda full with the two of us and all our assorted gear. That’s one of the advantages of road trips over airline travel. When we’re flying, every item is heavily scrutinized. If it’s not essential, we leave it behind. When driving, pretty much anything that might come in handy, we throw it in the trunk or the back seat somewhere. This way I don’t have to feel bad about not picking up hitchhikers, so that’s a plus. Sorry, dude, no room. 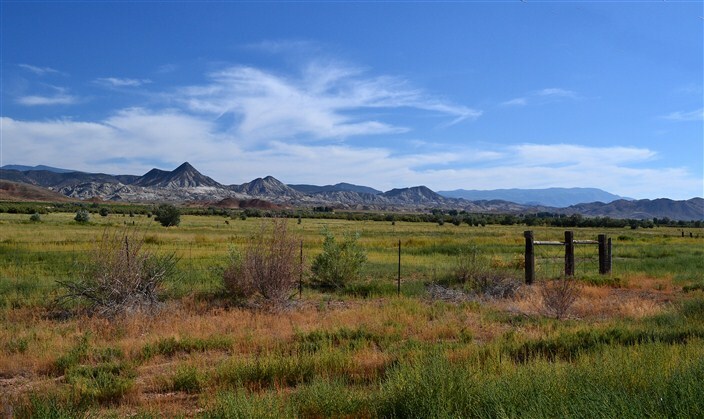 Why the Southwest? Well, we’re always looking for new horizons and roads not traveled before and New Mexico fit the bill this time. 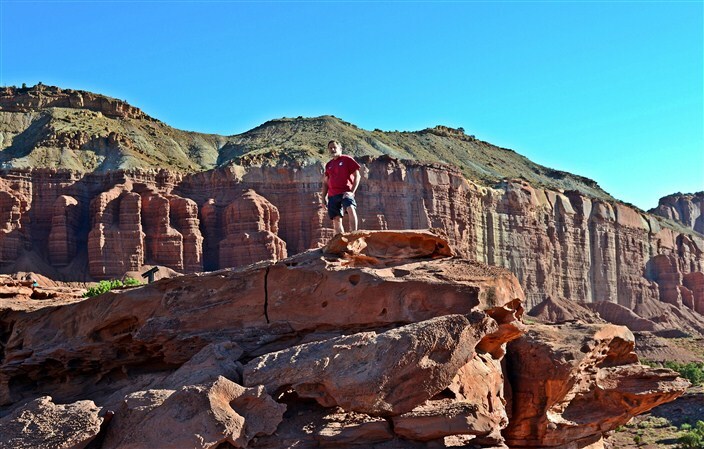 As for Arizona, though I’d been to the Grand Canyon once twenty or so years ago, my wife had never seen it and if there’s one quintessential American destination, it has to be the Grand Canyon. I read up on New Mexico and it sounded intriguing, Land of Enchantment and all that, so we hit the road. Honestly, not a whole lot more interesting than day one, at least the first part. 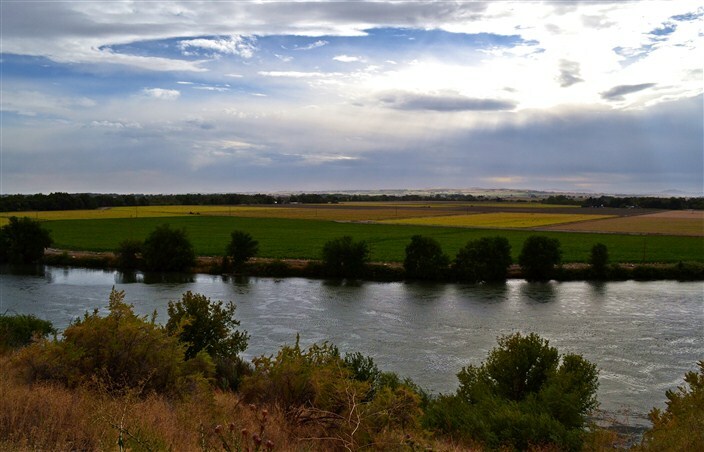 The weather cleared up, but Southern Idaho and northern Utah along I-84 are totally interchangeable and not the most scenic part of either state. Then we hit the population corridor of Utah south on I-15 from Ogden, past Salt Lake City and Provo. Been there, seen that before so we breezed on by. 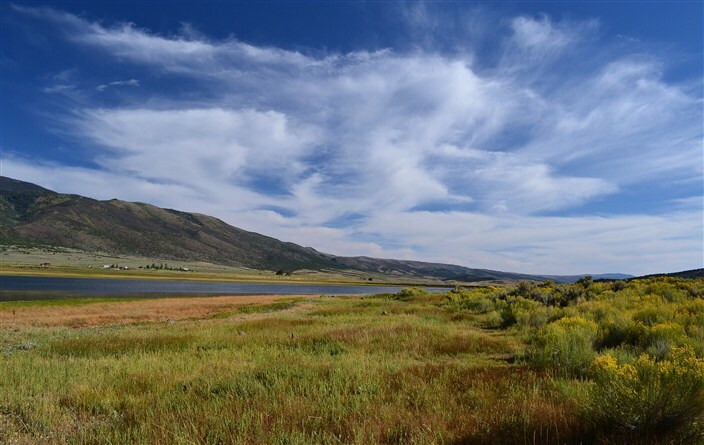 Once we got off I-15 onto Highway 28, however, things immediately got a lot more scenic. So why didn’t we do this sooner, you ask, rather than sticking to the interstate so long? Simple answer: time. 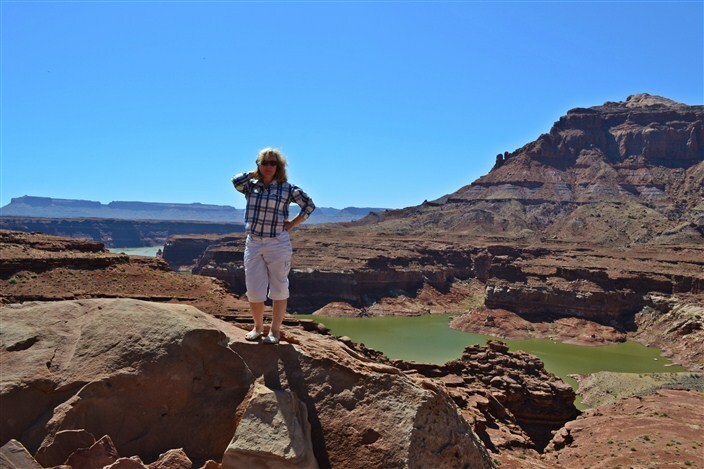 With a twelve day maximum travel window, and alloting three days travel both outbound and homeward bound, that left us only six days to see and do everything I hoped to do at our destination(s) unless we wanted to spend fifteen hours a day driving. No, thank you. Since we’d come this way and seen what lies between home and central Utah before, I figured to mow down the miles early and have more time for dawdling and seeing new stuff from this point on. Highway 28 morphed into 24, another beautiful road. We ended the day in Torrey, Utah, and if you’ve never heard of it, don’t feel bad. I doubt anyone outside of the county has. It’s a small, rural town – more like a village – with a gas station, two motels, a b&b, and two or three cafes. 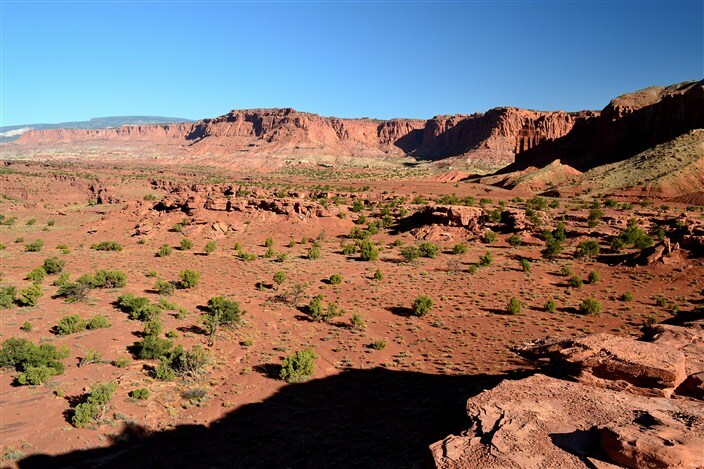 The reason Torrey has any motels at all is because it’s located only seven miles or so from Capitol Reef National Park, one of Utah’s five N.P.’s and probably the least well-known and visited of the five. We went for a walk after dinner and enjoyed the silence, a beautiful sunset over the surrounding mountains, and said hello to four deer prancing across the road in front of us and through someone’s yard. 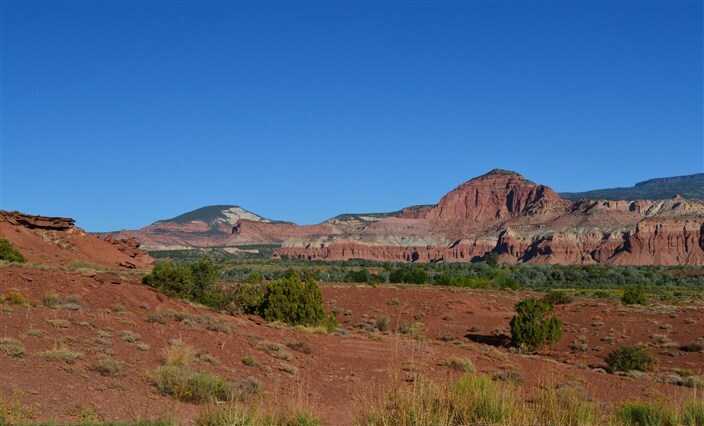 Next morning we left Torrey relatively early and were quickly within the boundaries of Capitol Reef N.P. We stopped at a couple of scenic turnouts and got some great photos, then continued on to the visitor center where we discovered we were not the only ones who’d thought of getting here early. The parking lot and visitor center were already jammed solid with plenty of other park afficianodos. Seems I was also not the only one with the brilliant idea of traveling post Labor Day weekend to avoid crowds, something which would become a recurring theme throughout our trip. The vast majority were of what I’d tactfully call the “gray-haired set.” Fine with me. At least there weren’t hundreds of screaming kids milling around wreaking havoc. We had planned on taking the 17 mile scenic drive into the heart of the park, but cancelled that idea when it took me ten minutes just to back out of our parking space and leave the parking lot. Seriously. We sat there behind a giant caravan of more than twenty other vehicles heading off in that direction and not moving at all. I hated to miss it, but the drive would have taken at least 60 to 90 minutes under the best of conditions. Stuck behind this bunch moving at the speed of a crippled snail – forget it. 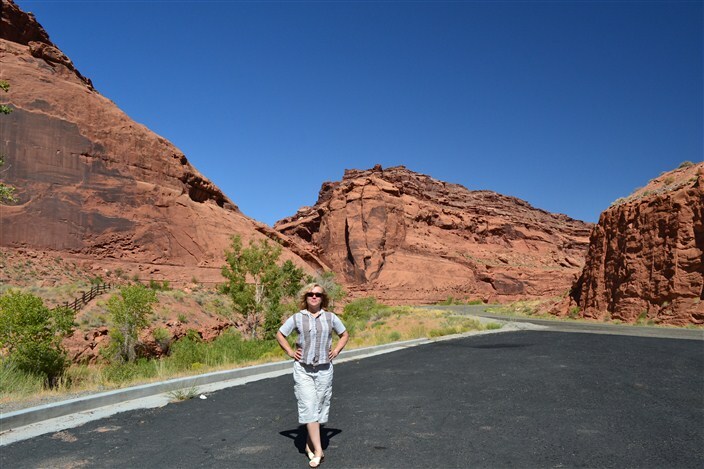 We moved on through the rest of the park on Highway 24, enjoying the gorgeous red rock scenery and promising ourselves to return someday and do a trip devoted specifically to the Utah parks. 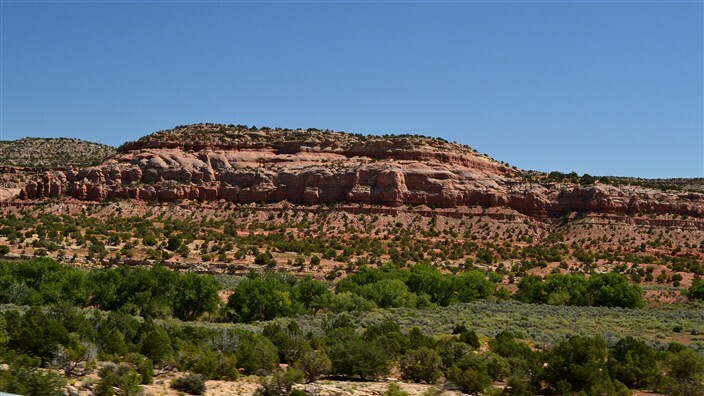 We continued along Highway 24 and found the majority of the scenery every bit as wonderful and varied as anywhere we’ve ever driven: the aforementioned red rocks, canyons, plateaus and mesas, forested rolling hillsides. If there’s a non-scenic drive in this part of the state, we’ve certainly never found it. Okay, that’s not entirely true. 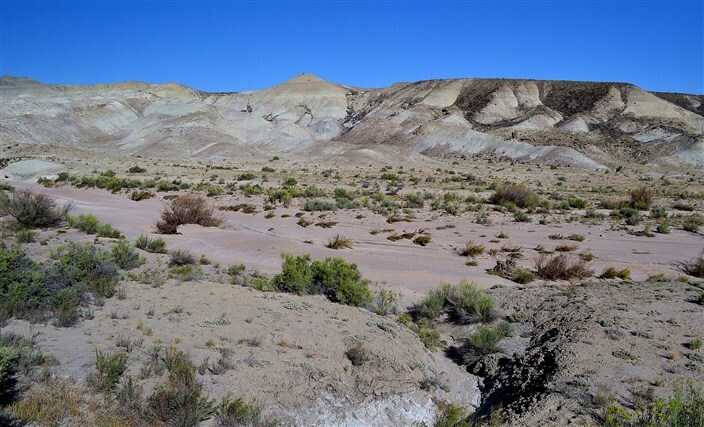 When we reached the extreme southeast corner of the state it got pretty barren and dry and not all that interesting. 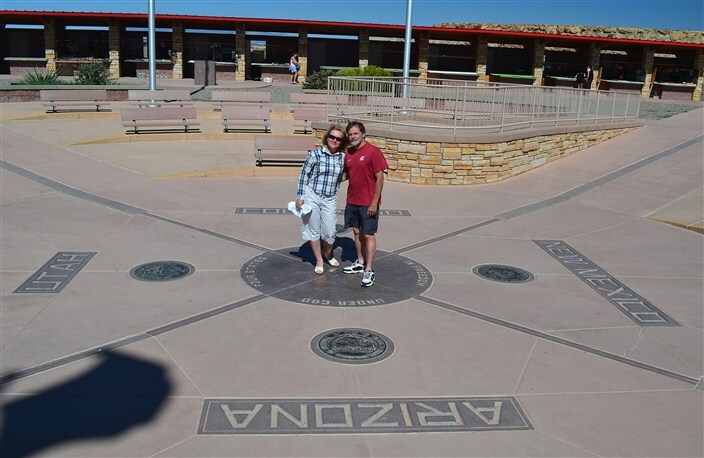 I would have passed up the region altogether if not for our first stop of note being located in the area – the Four Corners Monument. 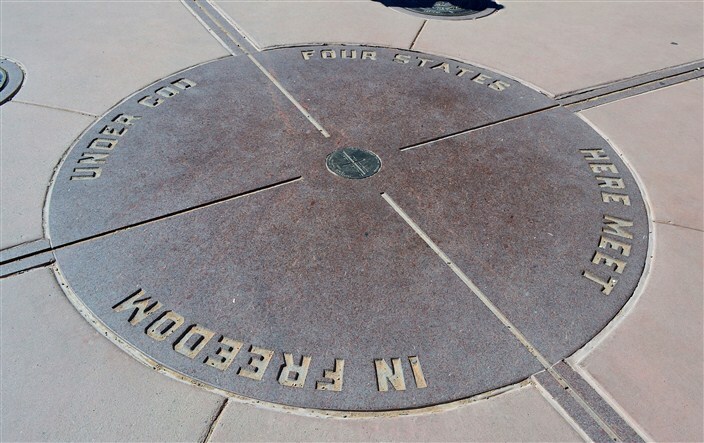 As most people know, this is the only place in the U.S. where the boundaries of four states – Colorado, Utah, Arizona and New Mexico – intersect at one point. 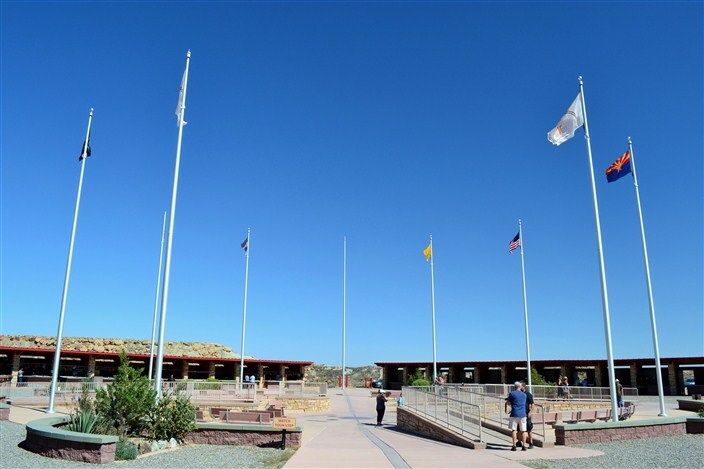 The Monument is actually located within the Navajo Indian Reservation and is run by them. You drive in, pay your fee – $5 a person – park your car and walk on in. It’s a pretty simple setup. Flags of the various states involved flap in the incessant, dust-whipping wind, people line up to take their photos, and the whole thing is ringed by vendors booths hawking “authentic” Indian jewelry, rugs, t-shirts, and every other type of tacky tourist knick-knack you could want. Okay, the whole thing is kind of cheesy and a little silly, but when will I ever have another chance to stand in four states at once? We took our photos and didn’t linger long in the hot, relentless midday sun. From there we jumped into the northwest corner of New Mexico and hit the gas. We blew through Farmington on Highway 64, then headed south on 550 which was a pleasant surprise. I expected another two-lane, meandering, not very quick drive. 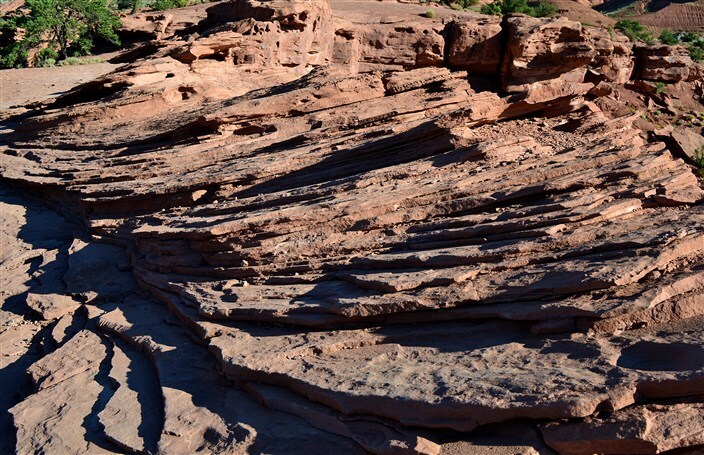 In fact it was a four lane, divided highway, virtually like an interstate. Not terribly scenic but great for eating up the miles. 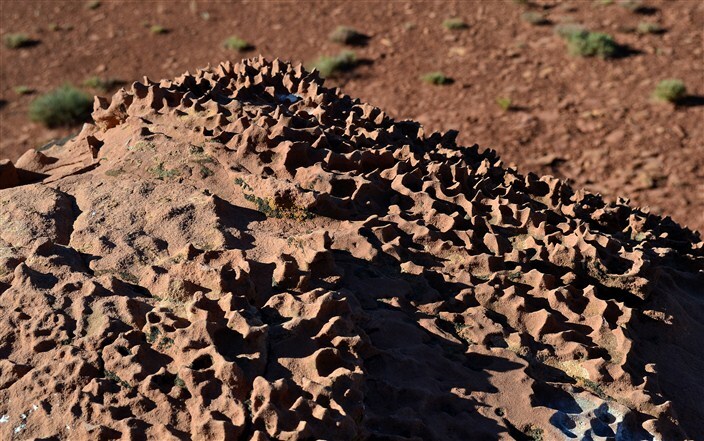 I hoped to make it to Santa Fe by nightfall and it was still a long way to go. We didn’t make it. We got into Bernalillo around 8:30 when it was already dark, and still an hour or so from Santa Fe. We didn’t want to come into Santa Fe in the dark, plus we were weary from three days of hard driving. We took a motel and figured an hour or less of driving in the morning was close enough.